These precision manufactured lenses have been designed to allow users to increase laser brightness on effects used to scan audiences, without increasing potentially harmful exposure levels. They are designed to be mounted at the laser projector’s scanner output, acting on effects that travel below the horizon, softening power density of these beams, but increasing the beam divergence by a set amount, providing a very effective means of keeping effects below the exposure safety limits (MPE). On a laser system not using a safety lens, the only practical option to ensure exposure limits for audience scanned effects are not exceeded, is to turn the power down on the unmodified beam. The result is in an effect that can look much dimmer than the overhead beams not used for audience scanning. This technique also suffers from a major flaw if the same laser projector is being used to create both the effects, in that a software/hardware failure or programming mistake can end up in sending a tight high-powered beam down into the audience area. Pangolin’s Safety Scan lenses overcome these issues, providing an effective method to make brighter looking beams that are still below the safety limits, and, if correctly installed, a fail-safe method of being able to use the same projector for intense overhead effects. Six different strengths of lens are available allowing the divergence of the beams used in the audience scanning effects to be adjusted as required by the environment they are being used; short projection distances such as nightclubs etc, will likely require one of the stronger lenses (-4 to –6) to increase the divergence on the lower audience scanning beams. While use in larger venues, scanning over greater distances can often use one of the lesser strength lenses (-1 to -3). Dimension: Lens max. width is 60mm. Using a beam of greater divergence is hardly noticeable over shorter throw applications, because the effects travel down below the horizon, meaning that audience is viewing the effects head on to the source. In fact, over such distances effects can often look brighter as the energy is being dispersed over an increased area in the space between the projector and the viewer, rather than maintaining higher levels to saturate the retina with, as the light enters the human eye. It also leads to more comfortable viewing of direct exposures. 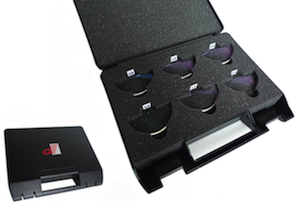 For laser providers working in different venue types (and therefore projecting over a range of distances), we recommend investing in a complete set of 6 of the lenses, giving you the option to swap different lenses in and out of your projector configuration as required. The lenses, when bought as a set, come complete with their own especially designed case to keep them safe during transportation and storage. The lenses are also available on an individual basis too, which is ideal for fixed installations, where only a single lens type will be required for each projector. Pangolin have produced a user manual, which includes a number of tables to help you decide what lens strength you need. You are welcome to contact us, if you have any questions about lens suitability. Safety Scan Lens Set US$ 695 (approx UK £465 +VAT) Including all six lenses and carry case. The lenses are easy to use, and simply need to be securely positioned at the output window of the laser projector, and then use your laser power meter to confirm the power density at the closest point of audience contact is set correctly. 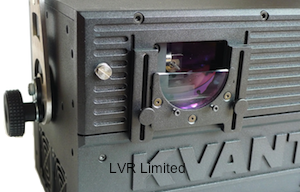 The image shows the Kvant lens holder in position, securely holding one of the Safety Scan lenses. For projectors that do not have a mounting provision, it should be possible to add a similar mounting point to use either Kvant’s, Pangolin's or a design of your own. Full details of Pangolin Lens Holders can be found here.